Well, my house “do up” is finally complete after 2 years and the Barbecue I held to celebrate it went really well. I even wore a martial arts outfit, as my alter ego “The weekend Ninja”. I’ve seen loads of interesting plays, talks and comedians recently (which you’ve probably seen on facebook/twitter). Not long now before I go off to Burma and Nikki and I will be celebrating 4 years together while away. For now, I’ve converted a few older pages and written this recent piece about a nostalgia inducing trip to Llanberis. 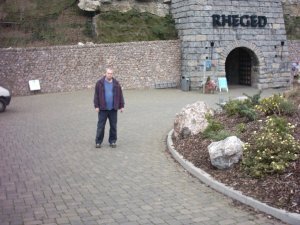 Looking back on an ill fated trip to Snowdon (we were meeting my brother at the top and the train he was on broke down). Theres always a silver lining. 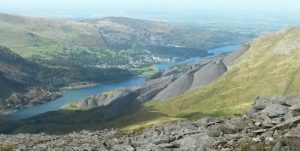 We walked up the Llanberis path (I’ve done all 6 routes up and down and the Llanberis path is easily the dullest) and noticed an interesting ridge off towards Llanberis. Closer inspection on the map confirmed it as Moel Ellio. Seed planted, I knew we’d come back to “conquer” it. Although Nikki is my girlfriend she’s also a free individual. As such I really appreciated all her help, now that the work on the house (much of which she’d either done herself or motivated me to do by nagging) had been completed. Some sort of nice reward seemed to be in order. 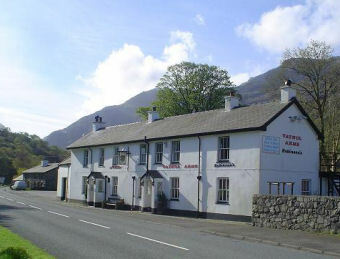 I booked us 2 nights at the youth hostel in Llanberis. 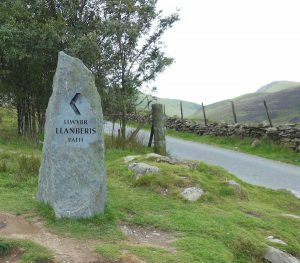 We were looking forward to it, as we hadn’t stayed in that particular youth hostel and Llanberis has always been special to me. 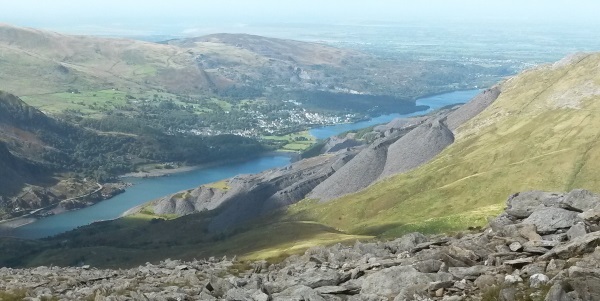 Just like Chris Bonington, Snowdon near Llanberis, was the first proper mountain I’d climbed under my own steam. 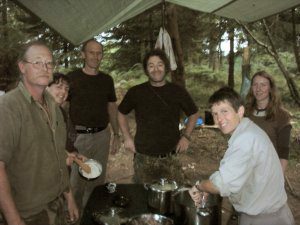 The following summer I had an amazing trip there with Jason Macdonald, Caz, Lee Sawbridge and Jane Smith. 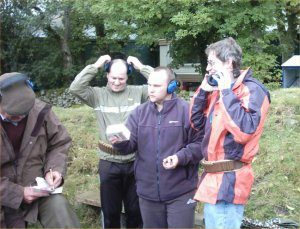 I’d always wanted desperately to be an outdoor pursuits instructor. Bit by bit I realised I wasn’t cut out for it and perhaps an alternative career would be better. 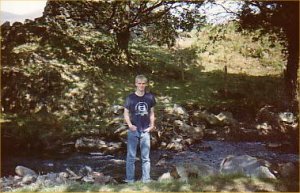 As I stood next to the stream near the fairy glen I made a decision. 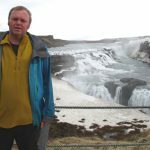 I’d build an exciting career in computers and use the money I made to fund a life of adventure. At that moment I was sad as I knew I was giving up a dream, but I was filled with an expectant energy about the future. 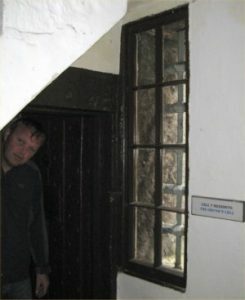 Back to the present day, and Nikki and I check into the hostel. 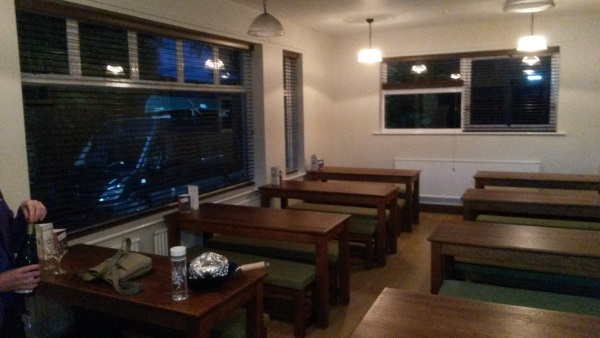 The hostel is modern, bright and spacious. But on the lane leading up to it, there were a number of maintenance vans and we didn’t know why. 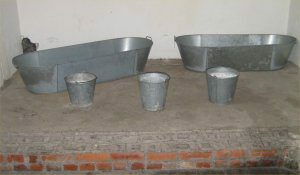 Well, the hostel had no running water!. But it was Friday night, so I just drank beer and we ate the delicious Thai Green curry that Nikki had prepared. The following morning and were up and out on the hill. The normally excellent instructions from walking world fell a bit short so we improvised (I love walking world with its normal easy to follow instructions, but ALWAYS take an OS map in case of the unexpected). 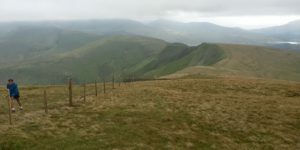 So, Moel Ellio completed. To honour the occasion, I gave it a new name. I decided to call it the Elephants back. We complete the walk, get back to the hostel and get showered and cleaned up. With dinner reservations already made, we’ve got a couple of hours to kill. 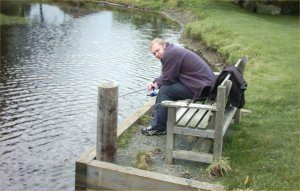 That summer we spent an evening at the Padarn lake hotel. They had a normal bar and a ramblers bar. I’ll never forget how busy it was, people were just sitting out on the flags outside in the sunshine. Inside Lee and I found a corner and talked about the future, when Mac and Caz played Double Dragon. Sadly today, its a sports bar and has nothing of its previous character. But this was made up for with the award winning Peak restaurant where we had dinner. Beef and Ale pie and Mash, washed down with Moretti and later a Chilean Merlot. Off to bed to a good nights sleep (well as good as you can in a 3 foot wide bunk bed!). In the morning, we eat another hearty breakfast at the Youth Hostel, then walk 2 miles out towards Pen a pass. We pass a campsite I’ve stayed at several times. I remember when we came here with Caz and Yvonne(friends at the time, now married for over 20 years). Yvonne had decided to climb the highest mountains in England, Scotland and Wales and on this weekend it was Snowdon. We’d seen an amazing hill from the Elephants back the previous day. 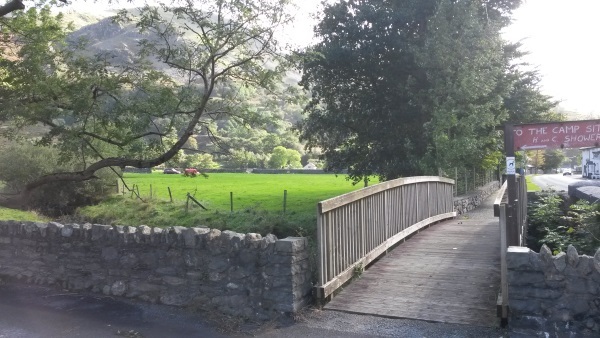 Walking on open ground is about 3 times harder (and slower) then walking on a path. Walking over rough terrain is about 2 times harder (and slower) than walking on open ground. This was rough terrain, extremely steep and throw in some scrambling half way up. An incredibly challenging route. After 5 hours, were rewarded with this amazing view back into the valley and the Padern lake. Back down the hill by another way (still no proper path) but we’d worked out a smart circular route for next year. Back at the bottom of the hill, the Vaynol arms beckons and we get a nice drink before heading back. On the summer trip, we camped here. I remember almost everyone on the campsite headed for the pub around 7pm. Its still got loads of climbing memorabilia and pictures of famous names like Don Whillans. Its then that it hits me. We’ve left the car back at the youth hostel, so we have to walk 2 miles back to Llanberis then up a big hill!. Another brilliant weekend, then off back home for bath and dinner in Urbano 32. 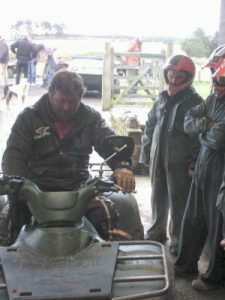 A few friends and I decided to spend a weekend at Rookin House Farm, doing activities like quad biking and shotgun shooting. Here we assemble in reception, ready for action. We chose to stay in the Luxury Camping barn at the farm (to avoid people arriving late, cars breaking down etc) on Friday night. On a lads holiday, most people are hammered when the go to bed and the curtains matching the quilt cover is hardly an issue. Fantastically, it featured a pool table !. 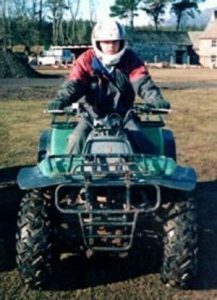 On the right of this picture is a stalwart all terrain vehicle, that I had previously driven. Frank and I arrived earlier than everyone else, so we were able to go Pony Trekking. 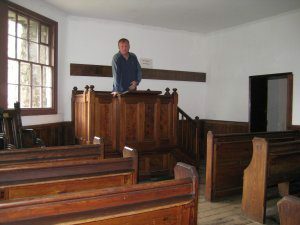 I have sat on one many times, while someone led it, but this time, I wanted to “take the reigns” myself. 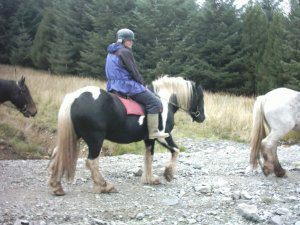 The horse I was riding, was called Minstrel. I found a web site with some horse riding instructions here. 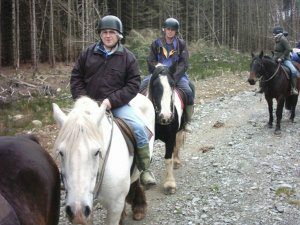 Riding, really is a fantastic way to see the countryside. The horses are virtually silent, and can travel over almost any terrain. Sometimes my horse didn’t want to go so I had to talk to him. It was great the way I could “steer” the horse with the reigns. 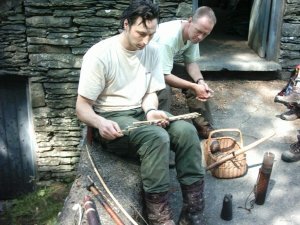 With a few hours left, before everyone arrives, Frank and I decide to try out hand at fishing. We borrowed the relevant equipment, and got started. To be honest, there were hundreds of fish, and you could practically put your hand in and pull them out. In any event, we were delighted, when we actually caught one. 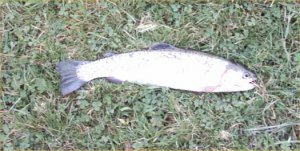 This is the fish that we caught, it was nearly a foot long. A very manly hunter/gatherer moment, turned to farce, as the Fish flapped about (he wasn’t the only one flapping at that moment !) and we realised what the fishing priest was for !. 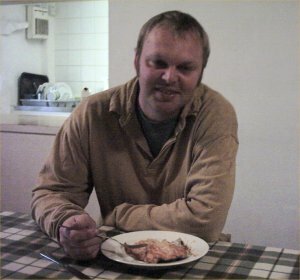 With my Bushcraft experience, I was able to “prep” the fish, and here, I eat it for breakfast. 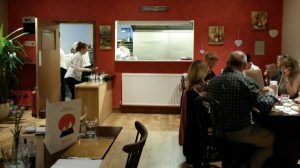 On Friday evening, we had a big party ( a £10 night out, who could argue). Saturday morning, I cooked everyone a big breakfast. It was going to be a hard day for a group made up of mostly office workers. A short walk to our first activity, Archery. 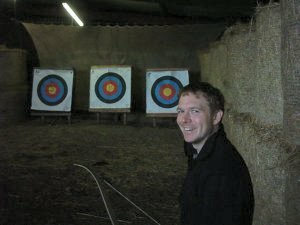 The weather wasn’t great, so we were able to do Archery indoors, which increased the accuracy of our shots (no side wind). 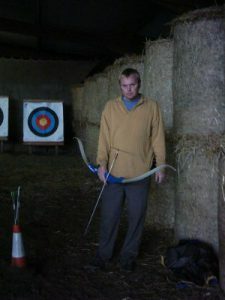 I had a go at Archery some years ago, and realized that although right handed, I “bow” left handed. I surprised myself, by coming 2nd at the Archery. Everyone poses with their bows. In the end, it was my super competitive Brother David who won the Archery. 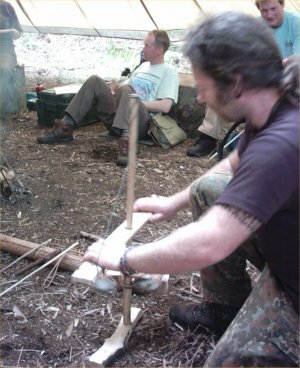 Since then, I have actually done a course where I made my own bow and arrows. Next we had a ride in an Argo Cat. 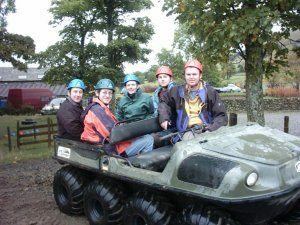 Its an all terrain vehicle, which is also amphibious. It was really exciting riding in it, but if you had too many the night before, it could separate you from your breakfast. While up there, we decided to visit the The National Mountaineering Exhibition the the exhibition had closed for the day when we arrived. The exhibition, is hosted in the Rheged centre and since we were there already we decided to have a look around. We were delighted to find a real ale festival was taking place and the non-drivers got involved in that instead. 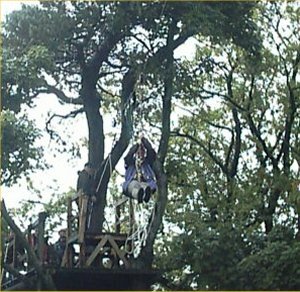 When I have been to Rookin House farm before, I have always been fascinated by the zip wire. 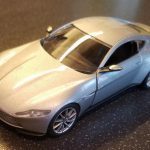 This time I decided to have a go for myself. 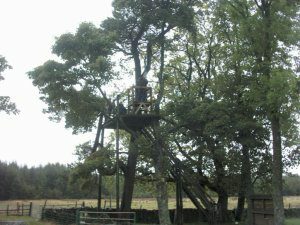 You have to climb to the top of a wooden tower. Then your harness is fastened to a safety rope. Its then a matter of sliding down the rope. The best part, is when you slide over the lake, and you can see it between your feet. There is a mechanism, so you come to a comfortable (comfortable !) stop at the other end. 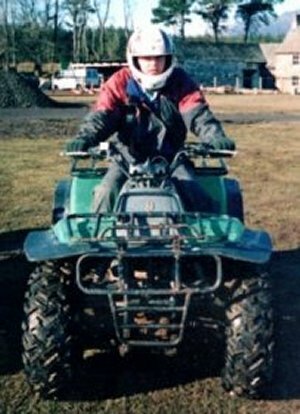 Here Alistair, shows us how to operate the “quad”. Of all my hobbies, I think quad biking is probably the most exciting. We went driving all around fields and forests and ravines for 45 minutes, it was excellent. 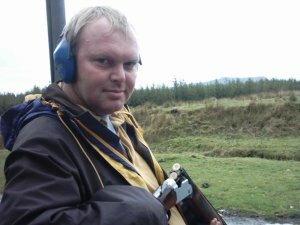 I tried my hand at clay pigeon shooting. 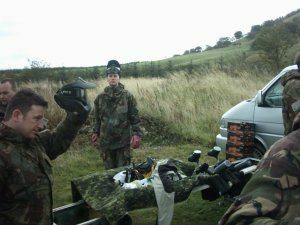 We were using over and under guns with auto ejectors. There were a few jokes about me coming from Manchester, and never having fire a gun etc. My brother David, distributes the ammo. 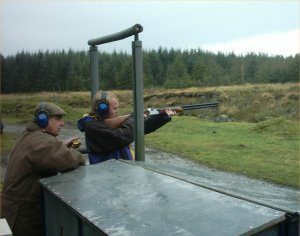 The instructor was a really nice chap, and taught us many useful things about shooting. For example, when hunting duck, you go for the legs. On Saturday evening, after the days activities, its time for a night on the town. 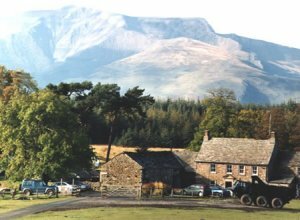 Keswick is my favourite Town in the Lakes and only 20 minutes drive from Rookin House Farm. We visited several local pubs but spent most of our time in the Keswick Lodge ,my favourite pub in the area. A few of my friends have Children, and don’t get to “do their own thing” very often. The evening really brought out the best in them. While out, I saw Steve Smith from Woodsmoke. 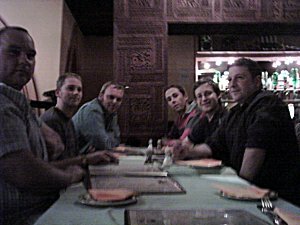 After this we went to the curry house next door to the Keswick lodge and had a fantastic meal. After closing, a few of us went to the “loft”. A crime against God, which purports to be a nightclub. Looking at the website, you would think its quite nice. Its not. 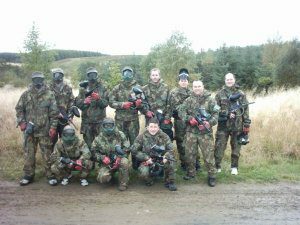 Next day, it was up early, and then paintballing. 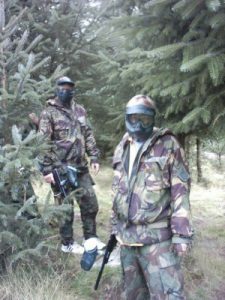 Everyone gears up, with face protectors, and NBC cammo clothing. Me and my friend Lee, preparing for combat. I want to thank all the people who came along, especially Danny and Ash, who drove up on Saturday. I would also like to thank Deborah at Rookin House Farm, for Organizing everything. A lot of people have returned to holidaying in the UK due to the stresses of airports and flying. My brother and his wife Leigh decided to rent a cottage in Anglesey for a week, and asked me if I would like to pop down for the weekend. Sounded like a brilliant idea do me, so off I went. Trearddur bay was our destination. We came here about 10 years ago with my mum for a family holiday. We were delighted to find that a new Motorway had been built and it was a lot quicker to get across the Island. 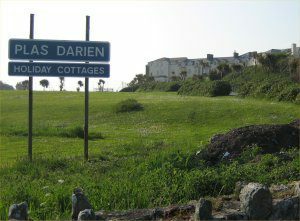 We had originally stayed at a Hotel called Plas Darien, which offered all sorts of activities like tennis and golf and things like that. 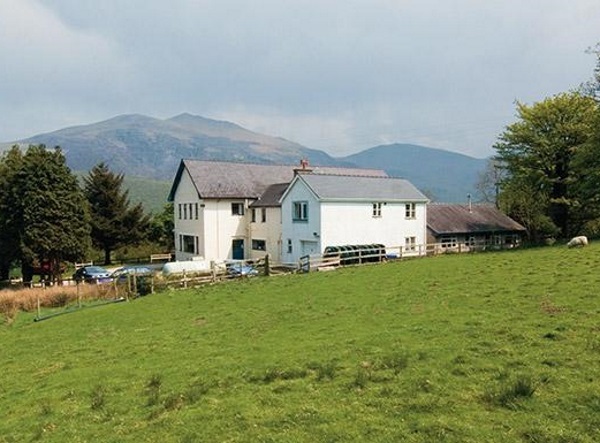 The place was a little run down to be honest, but as my brother pointed out, it was a superb base for a few days away. The area around Trearddur Bay, was just my kind of place. There were no nightclubs or any of that rubbish, just loads of peaceful sandy beaches friendly shops and cafes and other stuff like that. This famous house overlooking the sea, was featured in the film Wuthering Heights. I’d like to tell you that I did loads of great things on my first evening, but in reality, the pace of life catches up with you, once you stop racing, and I actually fell asleep before 8pm. A storm had hammered the bay during the night. I just slept through it. 12 hours of obviously needed sleep later, I awake to enjoy bacon “butty’s” with my brother and Leigh. 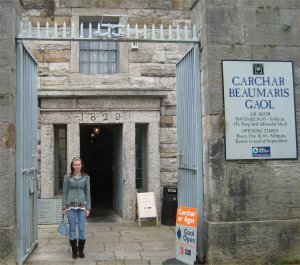 We head out towards Beaumaris, to see the famous Gaol there, now a museum. There were some amazing things to see. This bathroom doesn’t exactly look like its from the Burj al Arab, but in Victorian times, prison reformers had revolutionised prisons. Religion was considered important in order to help a person to rebuild his or her character. David joked, that since I spend most of my time preaching that I should pose at the front of the Church. For the record, I try to inspire people to seek adventure. I never tell people what they should do. 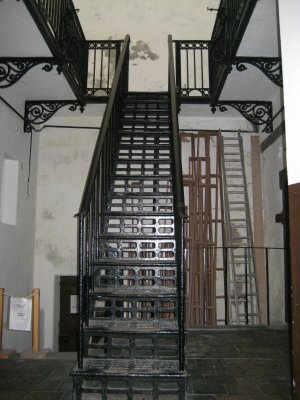 We head to the upstairs and the “modern” wing of the prison. I just loved this staircase, it was about as Victorian as you could get. 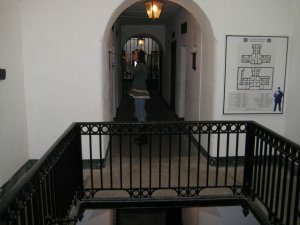 At the top of the stairs, we wander around the corridors. 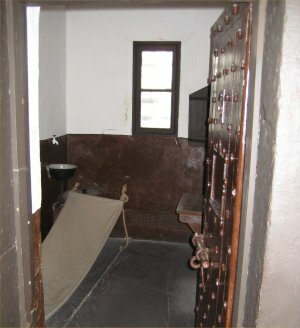 This was a standard cell, for an inmate. I was surprised to see, that instead of hard beds, they featured hammock style canvas beds. 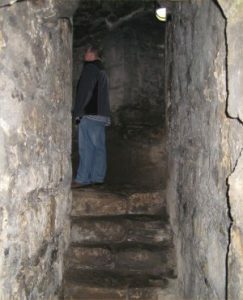 The doors were solidly built, I couldn’t see anyone breaking out of there. 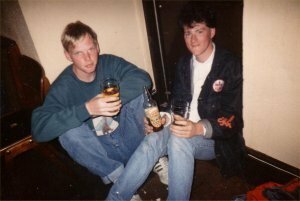 For the 2nd time that morning, I indulge my brother, and agree to be photographed next to the Drunkard Cell. 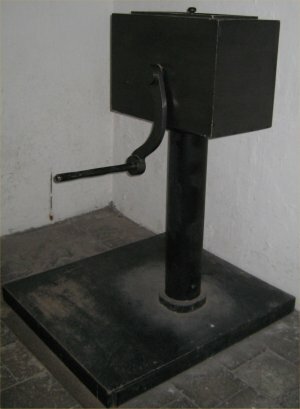 Some of the cells had this device in them. It was filled with Sand and Grit, and it required a great deal of effort to turn it. There was a counter on the box, and an inmate had to do 3000 rotations, in order to get breakfast. No work – No food. The thing I found astounding, was that the box served no practical purpose, and the hard labour put into it, achieved nothing in reality. 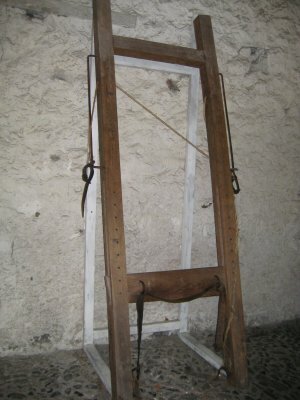 A whipping frame, where people had their shirts removed and were fastened to it, before receiving punishment. Disturbingly, devices like these are being used in places like Thailand and Singapore right at this moment. 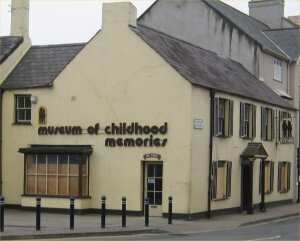 I was saddened to see that the Museum of childhood memories had closed down. 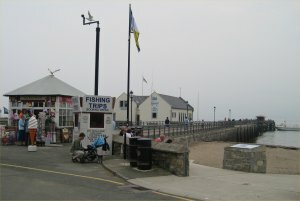 Overall, Beaumaris seemed to have degraded a bit, since I was there last. 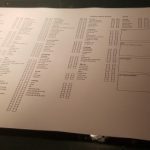 Several new hotels were under construction and I was sure that the next time I visit, everything will be back to normal. 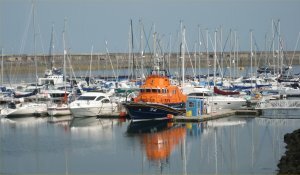 We wandered along the peer and had a look at the boats. There was a sailing race taking place, and they actually had 2 small canon to start and stop the race. For the 2nd time, I got to see Beaumaris Castle. I saw a program with Fred Dibnah. 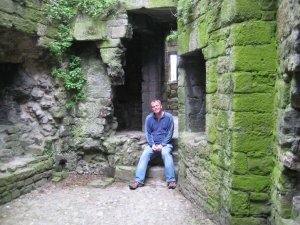 In it, he said if completed, it would have the been most perfect castle ever built. 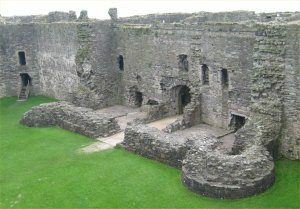 Work on Beaumaris castle, begun in 1295, it was the last and largest castle built by Edward the 1st. This is undoubtedly the ultimate “concentric” castle, built with an almost geometric symmetry. Conceived as an integral whole, a high inner ring of defences is surrounded by a lower outer circuit of walls, combining an almost unprecedented level of strength and firepower. 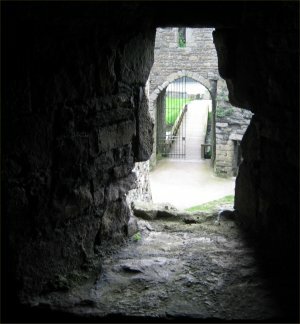 Ironically, should an attacker compromise the outer wall (no mean feat in itself) they would then be caught in a crossfire of arrows from both the outer and inner walls, with no available cover. 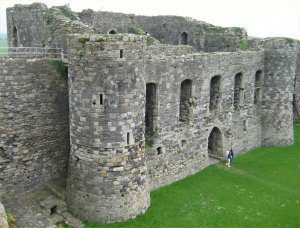 This side of the castle was completed. We wander around and explore inside the battlements. 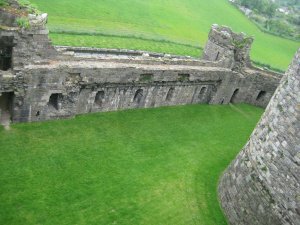 The archers would have been emplaced in positions like this, and you can see just how good a position they would have been in, to “pick off” the opposing forces. 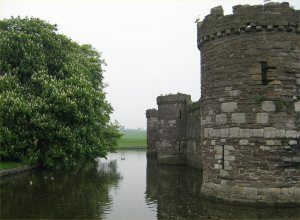 The third bay along from Plas Darien where some people were canoeing. It was here that I joined the Circular path. 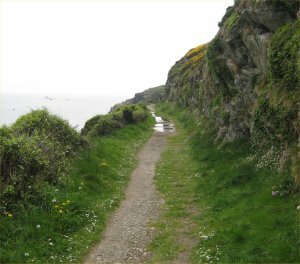 The Circular path follows the contour of the coast. I followed it for about 6 miles, it was just amazing to be back walking again. 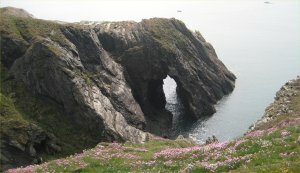 The path passed several other coves, this was one of my favourites and even featured a natural tunnel. 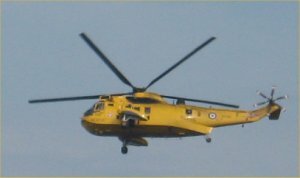 The yellow Sea King helicopter on Manoeuvres around the bay. Its always re-assuring, even in perfect weather to see this sight. 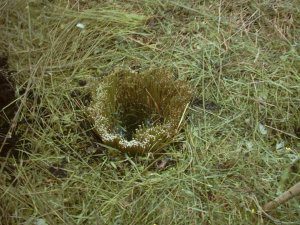 As I pottered along, I was really enjoying the weather, the feeling of the ground underneath my feet and the general well being of the moment. I decided to go walking as often as I can now (I need to get fit, and the one activity I love doing is walking). I haven’t done much walking since Frank left for Thailand, but I’m going to start “solo” walking. 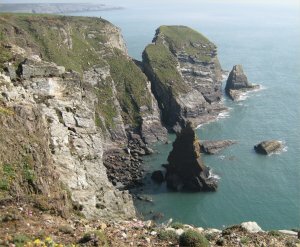 Another one of the beautiful coves, you can see the colour of the ocean and the rocks that rice out of the ocean. 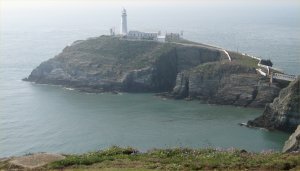 I leave the Circular path as it rejoins the road, wander along the road for a little while and then join the Anglesey Coastal path, which I know goes to the South Stack lighthouse. 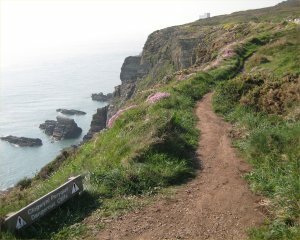 I wandered along for about 2 miles, before arriving at this path, which ran for a mile to Twr Elin only a foot or 2 from a 300 foot drop into the ocean. Designed by Daniel Alexander and completed in 1908. From here, there is a walk to the “stairway” then 400 steps down to the lighthouse. As I wander back along the road (taking the direct route home, it was a baking hot day). I stop by the original cove where I joined the circular path. 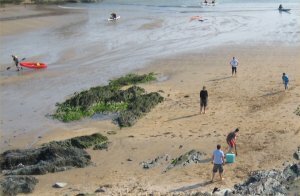 I was delighted to see a few lads playing the Great British game of cricket, using a ball they had found in the sea, a piece of driftwood as a bat, and a coolbox as wickets. I wandered passed the hotel, and made my way to the excellent Waterfront bar and restaurant to meet up with David and Lee. It really was excellent to watch the sunset with a drink and something to eat. I was really starting to relax now. Later on, we wander back to the Hotel. 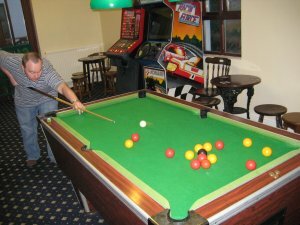 We had a couple of games of pool, but the table wasn’t very good, and the bar wasn’t just closed, it had been decommissioned. We headed down the hotel approach and visit the Trearddur holiday bungalows. 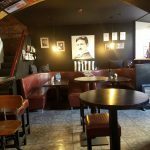 They had a nice bar there, and a singer in the main bar who was pretty good, but we headed for the games room. A pretty good evening overall. After another excellent nights sleep, its time to head home. 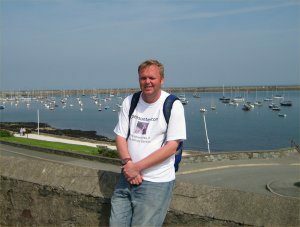 On the way in, my brother had picked me up at Chester, but going home, I was getting the train from Holyhead. I had beans on toast with Tea for breakfast, at an umbrella table. We decided to wander around, and see what the town had to offer. The Marina was rather spectacular. I had packed at fairly short notice, so after wearing my jumper the previous day, the only thing I had to wear was a brand new johnsunter.com T shirt that I had received in the post the day before. Relaxing in the Sun, listening to the waves lap against the shore. My brother and Lee then left to visit the Lighthouse I had seen the day before. I had an hour and a half to myself, to wander around the town. 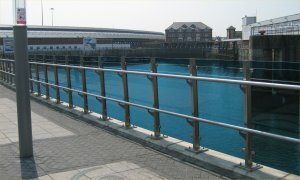 The port and railway station (not surprisingly) are right next to each other. I loved the way the whole thing was effectively on stilts in the bay. 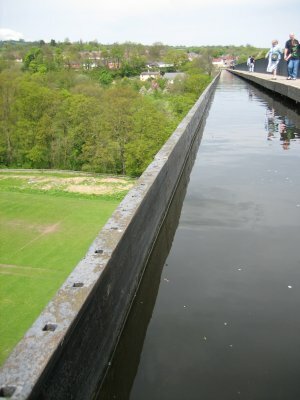 You can see the colour of the water in this picture. I almost wished I could go for a swim in it. 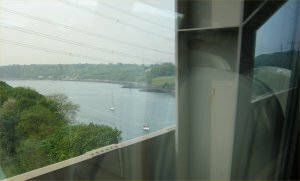 On the train going home, my last sight of Anglesey as it crosses the Britannia bridge onto the Welsh mainland. In only a day and a half I had done loads of interesting and exciting things, spent time with my brother that I don’t always get to do and generally relax. At the prices of accommodation there, Il be going back soon. The trip started off well. 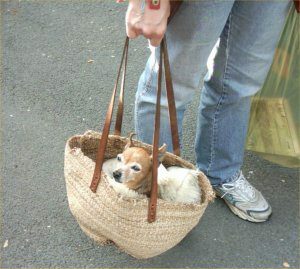 A woman on the train, had a tiny Piccanise dog, and carried it around in a shopping bag. I couldn’t resist taking a picture of it. 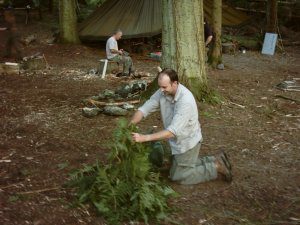 Woodsmoke have moved their camp to a different part of the forest. 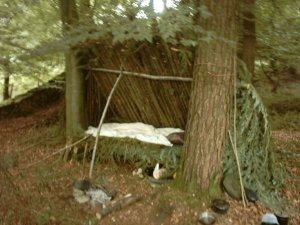 The idea was to build and live in natural shelters for the whole week. Ben always explains theory before any activity, and uses his skills as a fine artist to illustrate his ideas. I think white boards are fantastic (I have one in my office and at home). A classic Scandinavian lean-to shelter, with a raised bed. 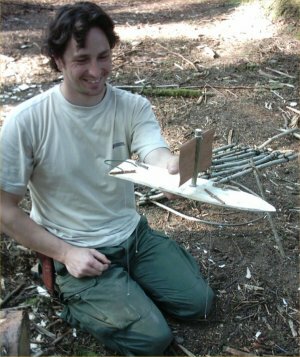 This one was constructed by Dave Alty. Dave and I were on the Abo course together, its always great to see him. 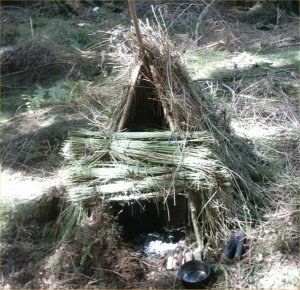 A chap on the course called Phil, had asked to build the most sophisticated shelter that woodsmoke could think off. 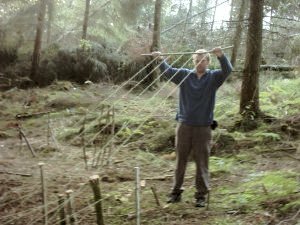 This shelter used a kind of hook at the top, and a v shaped fork at the bottom, so it sort of hangs of the tree. 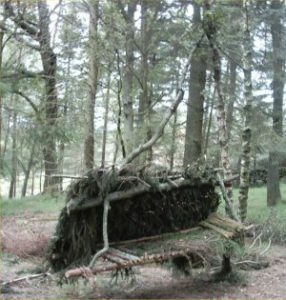 Its main features are that its raised of the ground, and can be moved around the tree to stay in the shade. Not so much a shelter, as a feat of engineering, I was totally impressed. 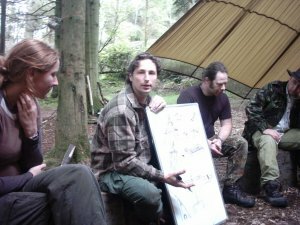 The course was designed as a kind of woodlander part 2, and covered advanced techniques of just about every major skill. Here Rob demonstrates a pump drill, originally designed for drilling holes. 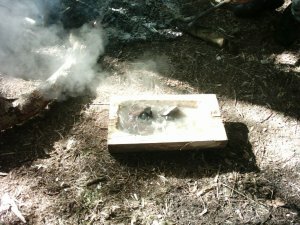 It was the easiest way to make fire from friction that I have ever seen. They had 3 different types to demonstrate. We spent a lot of time working on the fire drill. As Ben put it, its quite the most elegant way to light a fire. It required a lot of concentration to get it working. Here Jeremy attempts to get an ember. 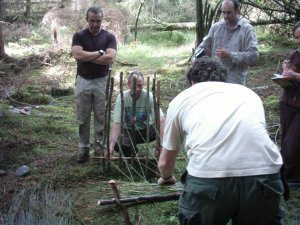 We were taught to construct a reed loom. It would enable is to make reed mattresses, which could also be used for “drop-down” shelter doors. 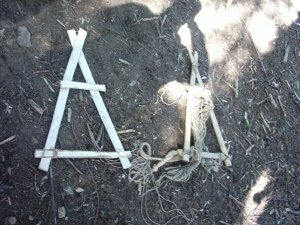 I wish I had known how to make one of these on the abo course. It was an amazing piece of primitive technology, and would enable a full nights sleep, which would transform the overall bushcraft experience. 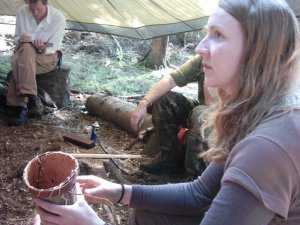 Lisa teaches us to construct containers from Bark. She had previously been on a course in Utah, where you had to survive for 10 days, without any man made products. 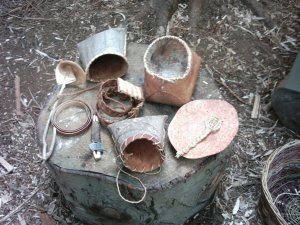 A selection of the things that Lisa had previously constructed from Bark, including a belt and knife pouch. I constructed a container for carrying berry’s and stuff like that. For some reason, I have an expression like a child in this picture, and I am not sure why. Anthony always teaches it with such enthusiasm and professionalism, that it doesn’t seem so bad. 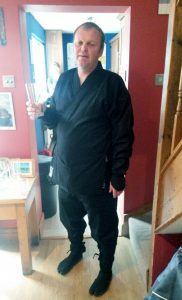 One of the lads, loses his Knife, and ends up looking for it in a bag of guts and offal. Adds a whole new angle, on taking care of your knife, as it resulted in him being shoulder deep, and later finding that the knife was somewhere else completely ! We put out some night lines, and I caught a fish. You will just have to trust me, I did catch one. The group collect around the boat house. In the centre of the picture, are the fish that we all caught. 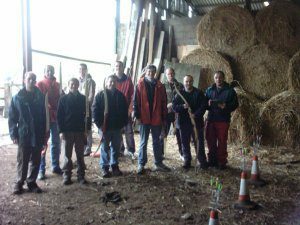 There were some brilliant personalities on this course. 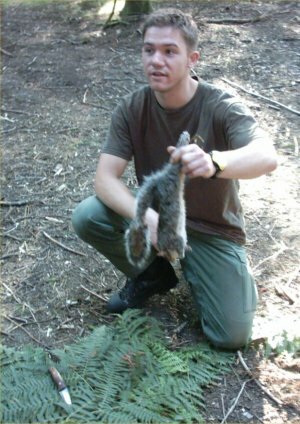 Ben gives a general interest talk on hunting and fishing. 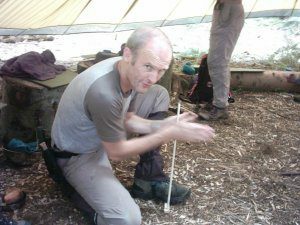 He shows us a small bow and arrow, used by African bushmen. Next to the bow, is a blow pipe and darts, which were amazingly accurate. 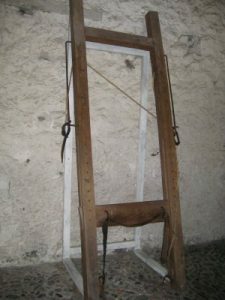 There was also, a traditional crossbow, but this isn’t in the picture. I have made an otter board before, but this is one made by a craftsman (Ben). It features 4 special holes, so a toggle holds the fishing lines in place. It also had a stone underneath, to keep it upright, and a sail made from a piece of bark. 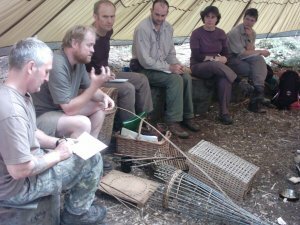 A whole day of the course was devoted to basket work, and featured guest instructor, Phil Bradley (Phil is the one speaking passionately about basket making). One of the good things at Woodsmoke, is that there is always boiling water for a brew. Here Lisa stops for a quick brew. 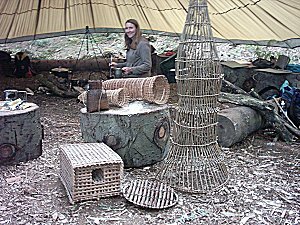 In front of her, are a selection of the baskets that Phil had previously made. Another lad on the course called Phil, made this fish smoker. The fish that came out of it, tasted delicious. A Roycroft pack frame. The design is brilliantly simple. The one on the right, was made by Lisa in Utah. 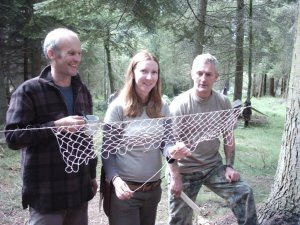 Lisa show Jeremy, Pete and me about making nets. 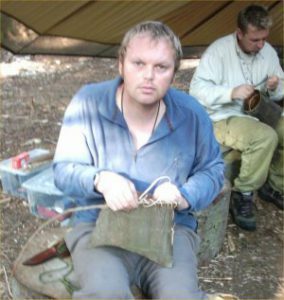 Obviously nets can be used to catch fish, but they also compliment the Roycroft pack frame, to make a functional rucksack. Unfortunately, this one didn’t work, and as Ben pointed out, there is no perfect formula, you just dig a few of them, and wait until one fills up with water. This one worked, and had reeds around the outside, so the water was cleaner. A lot of the self help books I have read, encourage you to think like a child. The idea, is that when you are young, you have dreams, and that as you get older, people encourage you to be “realistic” and in actual fact kill your enthusiasm. 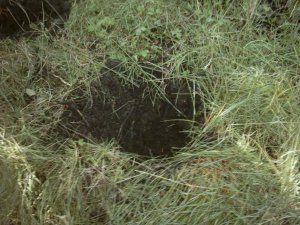 When I was at school, I remember a teacher talking down to me, and telling me “I bet you are one of those people who think you can get water just be digging a hole in the ground” !. 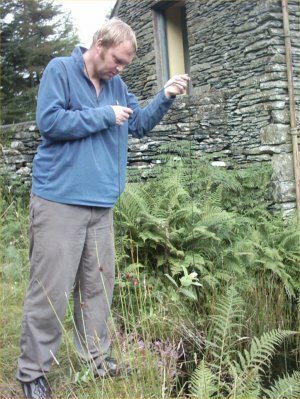 Mr Evans, from 1st year science at Moston Brook, back at you pal !. 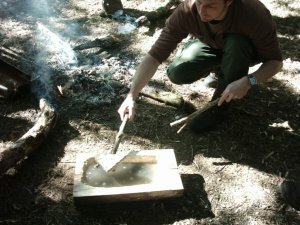 Ben demonstrates rock boiling, in one of the Swedish Doe bowls, constructed on the Axe workshop. Note the Y shaped sticks used to put the rocks into the bowl. The water is fully boiled, and is safe to drink. Dirt from the stones, however, makes the water a bit grey. 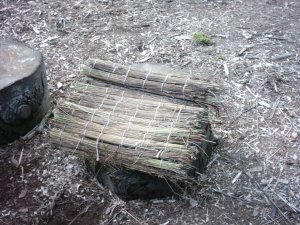 A box is constructed from bark and held together with small wooden pegs. 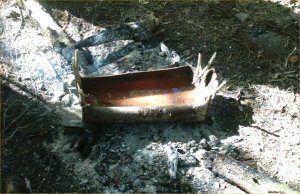 As long as the flame doesn’t go higher than the water, the bark container will not catch fire, and the water will boil. Apart from Jamie Oliver, I don’t know anybody that looks this happy in a kitchen !. To Celebrate my Birthday, I hired a barge for the day, from Anglo/Welsh barges. 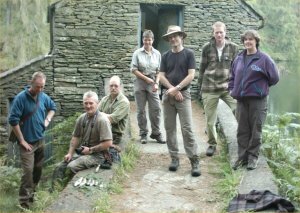 Loads of my friend from both Chester and Manchester came along for the day, which was thoroughly enjoyed by everyone. 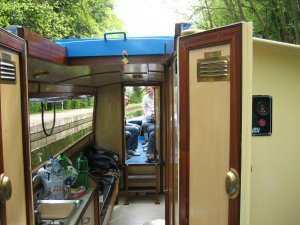 First things first, we loaded up the Galley (it was fully featured, and had a sink, a stove and a fridge). Sarah had prepared an excellent packed lunch, and we loaded up the fridge with the various beverages ranging from orange juice to vodka, and everything in between. My reliable friend Steve checks the last minute details, and we are off ! . 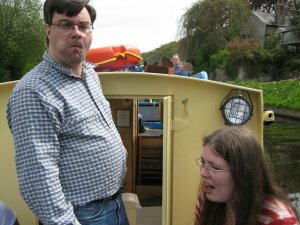 An aqueduct next to the boat yard presented some excitement. 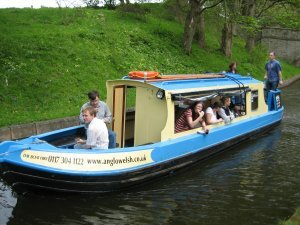 We had selected a barge, as sailing in one was extremely relaxing. 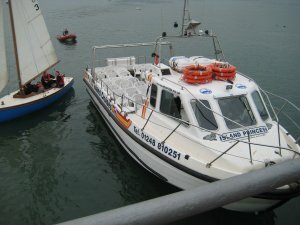 The added bonus to this, was that we could get off the boat, and walk in front of it, to take photographs. 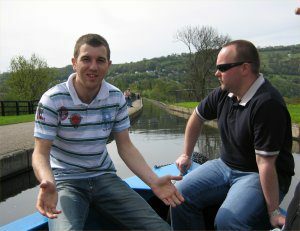 Mike Delafield, an old friend from the awful Corning, and my Brother David, chat about a possible pool match. 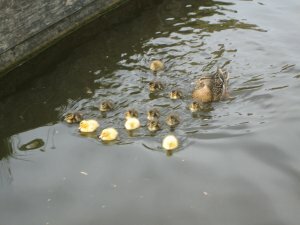 Some ducklings were spotted, which the “girls” wanted to be photographed. My friends Lee and Susan came all the way from Bury. 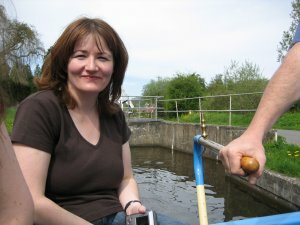 Here Susan poses next to the steering tiller (which her husband Lee commanded superbly, throughout the day. 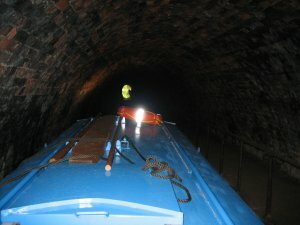 We headed into a tunnel, which was pretty exciting. 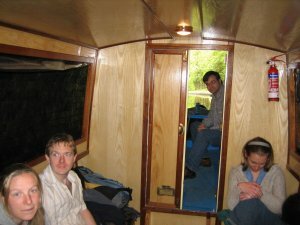 Inside, we activated the lights, so the boat wasn’t plunged into Darkness. An old friend, Jon Knight was able to join us, and brought his friend Claire who had joined us at our wedding. 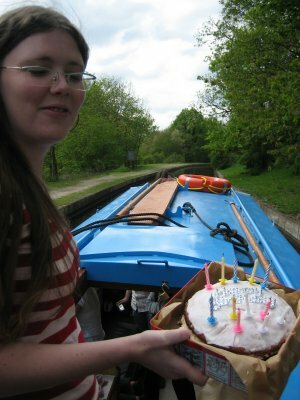 In the afternoon, Sarah produced a delicious birthday cake, she had made for me. 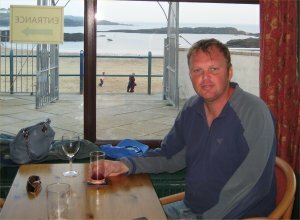 In the afternoon, we “sailed” to Llangolan, and had drinks in the Corn mill pub. 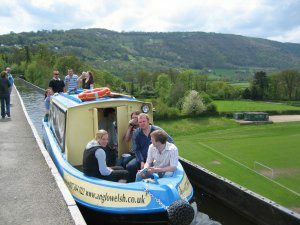 What a brilliant day out, if you fancy trying it yourself, visit Anglo Welsh Holidays.